Bob and Del built Billabong Sanctuary literally from the ground up, starting from a bare paddock and developing the park into an award-winning Eco-tourism attraction [more info here]. Through the years they’ve both remained actively involved in all aspects of the operation of their family-owned business, from frying chips to feeding crocs. Bob is General Manager, overseeing staffing, infrastructure and legislative requirements….. and now and then he still finds time to feed a hungry croc. These days Del enjoys semi-retirement behind the scenes, but is still very much involved in decision making, and encouraging and supporting the work of the whole team. Our Rangers are an incredibly talented mob, ferociously dedicated to wildlife conservation. They come from diverse backgrounds, but all are passionate about working in their ‘dream job’ caring for our native wildlife and sharing their knowledge and enthusiasm. Ray started his zoo keeping career as a volunteer at the former Cairns Wildlife Safari, where he soon found himself caring for the big cats, hand-feeding cheetahs, tigers and lions. 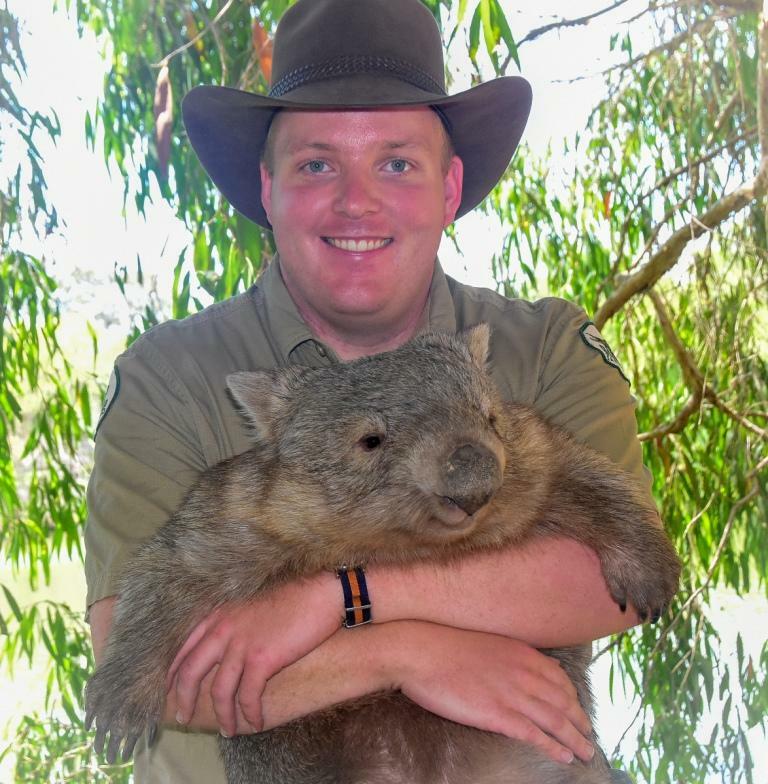 His love affair with these magnificent creatures continued at ZooDoo in Tasmania. Initially employed there as Senior Keeper, Ray was soon promoted to Park Manager. 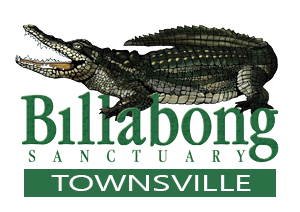 As Curator here at Billabong Sanctuary, Ray is responsible for the overall management of our entire collection of native animals, ensuring that they are given the best possible care in accordance with industry standards. He prepares the weekly staff rosters and daily run sheets, and is an active member of the team, working with them on the daily runs, presenting shows and conducting tours. Ray works regularly in the crocodile enclosures, as he completes his training to work with our big males and breeding females. 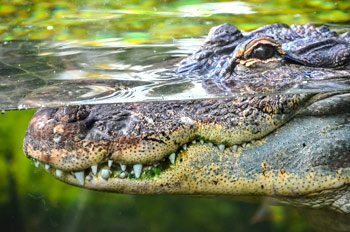 Although no stranger to large predators, Ray admits that crocs actually presented more of a challenge than lions and tigers. He has met that challenge and more, as he has recently started presenting the exciting Free Flight Bird Show. Always cheerful and engaging, Ray is a dynamic speaker, happy to chat with visitors and share his passion for Australia’s wildlife. 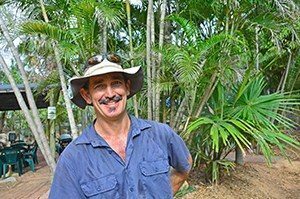 Dave is a reptile tragic, an experienced snake catcher who spent more than a decade working at Malcolm Douglas Crocodile Park in Broome, WA. 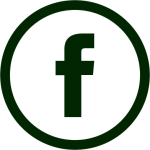 As Reptile Ranger, he’s in charge of the well-being of all our scaly critters, everything from the venomous snakes to the littlest knob-tailed gecko. You’ll see Dave at the twice-daily croc feeding shows as he progresses through our training protocols, learning the idiosyncrasies of each of our awesome estuarine crocodiles. All his wildlife talks are entertaining and well-informed, and he’s happy to stop and have a yarn about his adventures out west! Ranger Jess tried her hand at a variety of jobs and volunteer roles before deciding that her true path lay with working with animals. 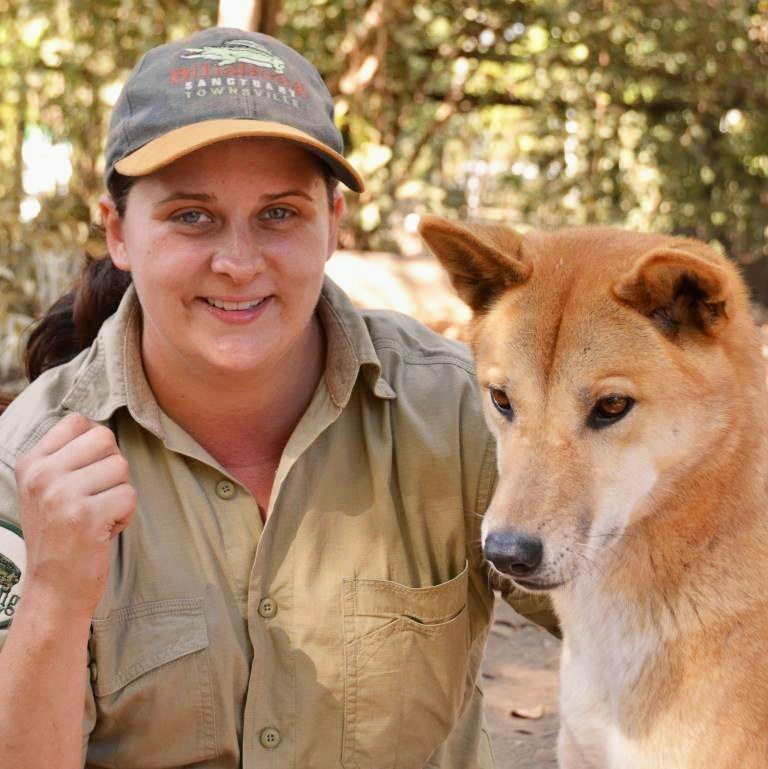 She has just graduated from James Cook University with a degree in Zoology and Ecology and has worked her way up from being a volunteer to a full-time Ranger. While she has had experience working with birds, Jess is enjoying being an all-rounder here, learning more about our reptiles and mammals. You’ll see her presenting all the morning shows, and she’s already well into her training to present the crocodile feeding shows. Jess has also taken an active role in upgrading enclosures, helping to build new garden beds for the echidnas and parrots. Her wildlife talks are assured and informative; you’ll learn something new from her every time! Ranger Renée is the mammal specialist on our team. 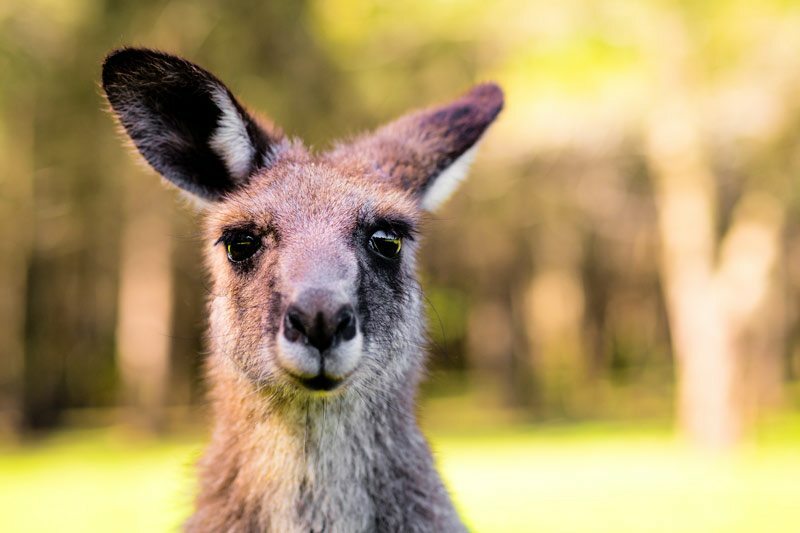 She has overall responsibility for the health, husbandry and housing of our native mammal collection, everything from the free-ranging kangaroos to those cuddly koalas. On any given day you might see her in the park weighing a wombat, pampering a pademelon, or coming to grips with a prickly echidna. Renee has recently been appointed Safety Officer, in charge of everything from emergency procedures to keeping the first aid kits stocked with band aids and Betadine. Renée is also an experienced presenter of wildlife shows, with extensive knowledge gained from her time at Wild Life on Hamilton Island. Before joining us as a Ranger, Kimberley worked as a supervisor at Crocosaurus in Darwin, where she helped to train the big boys—estuarine crocs over 5 metres in length! Now she presents all our own feeding shows, and trains her team mates to work safely with our own crocs. Kimberley is the official ‘sidekick’ to our Reptile Ranger Dave and has taken over husbandry of our many varieties of native lizards. 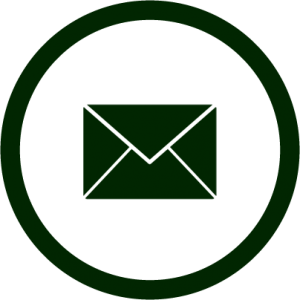 Their recent breeding successes reflect her commitment to their health and well-being. Kim has also started training to handle venomous snakes. She enjoys expanding her knowledge of our other native animals, and sharing it duringthe reptile and mammal shows. Busy as she is, Kimberley still finds spare time to create enrichment activities, such as food cages for the red-tailed black cockatoos. 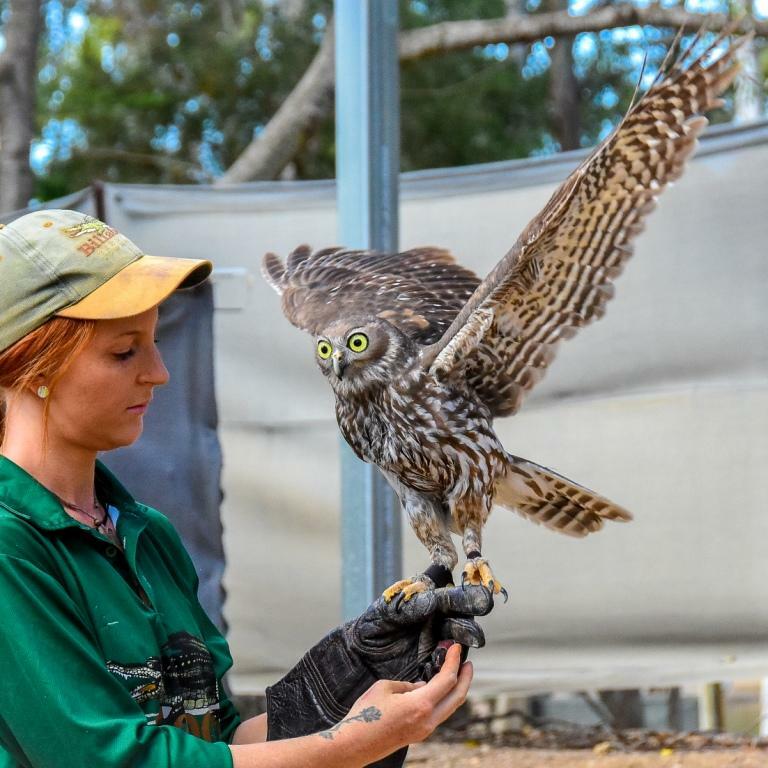 Elyse is our specialist bird keeper, overseeing the health of all our birds and training our birds of prey for the amazing Free Flight Bird Show. Working behind the scenes , she has formed a special bond with Roxy the barking owl and hopes to introduce him soon to the daily show. Elyse trains her team mates to work with our birds, including their weekly weigh routines. Patience and consistency are essential in training, but Elyse also has to ensure that our birds maintain an optimum weight so they are keen to fly when rewarded with food. After wrangling everything from camels to elephants in her previous job, Elyse was keen to accept new challenges, and has now completed her training to present the mid-day Venomous Snake Show, showcasing some of the most venomous snakes on the planet, from death adders to taipans. You will meet Elyse presenting other shows throughout the day, where her depth of knowledge, engaging personality and cheerful smile have made her a favourite with the public. 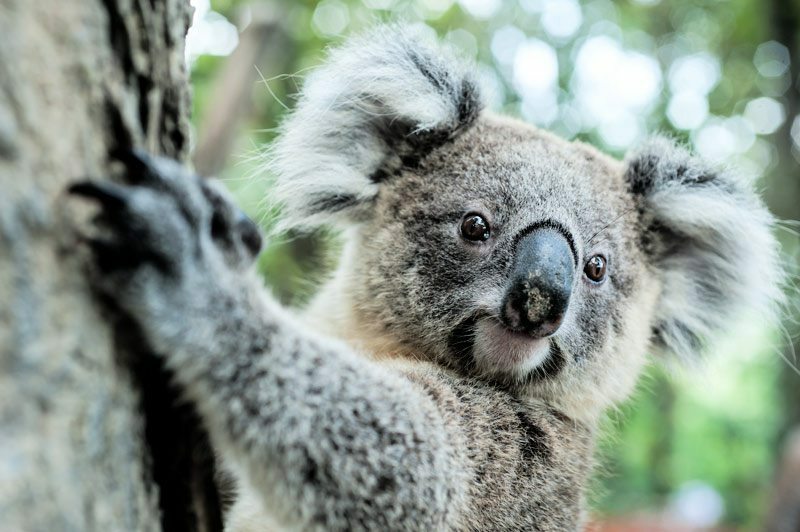 Ranger Will came to us from Koala Park Sanctuary in Sydney, where he worked as volunteer for 6 months while completing his TAFE Certificate III in Captive Animals. He then spent a year and a half as a ranger, working with everything from dingoes to penguins. 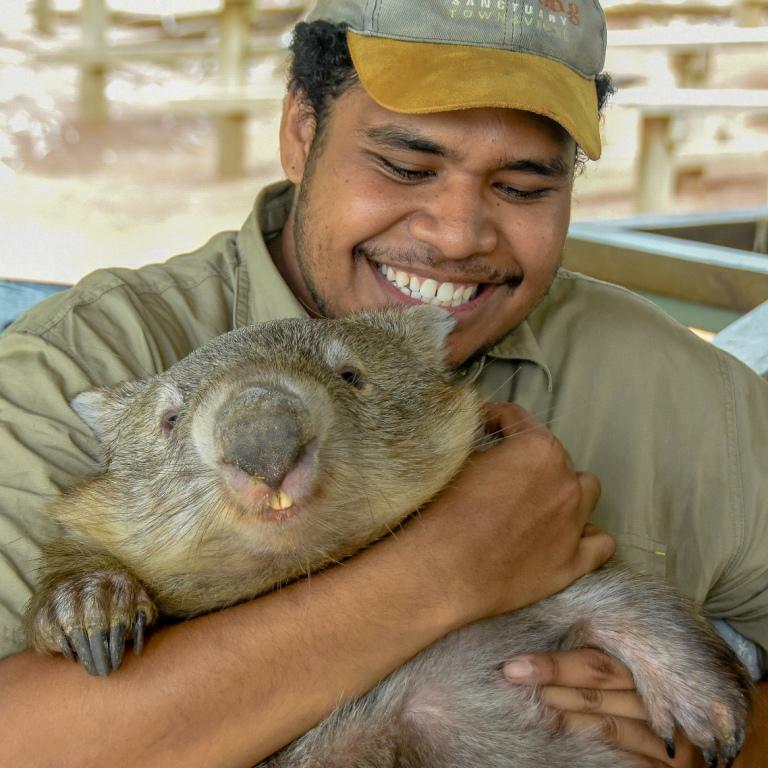 Here at Billabong Sanctuary Will helps our mammal keeper Ranger Renée with specialist duties like health checks and husbandry of our koalas, wombats, bilbies and macropods. 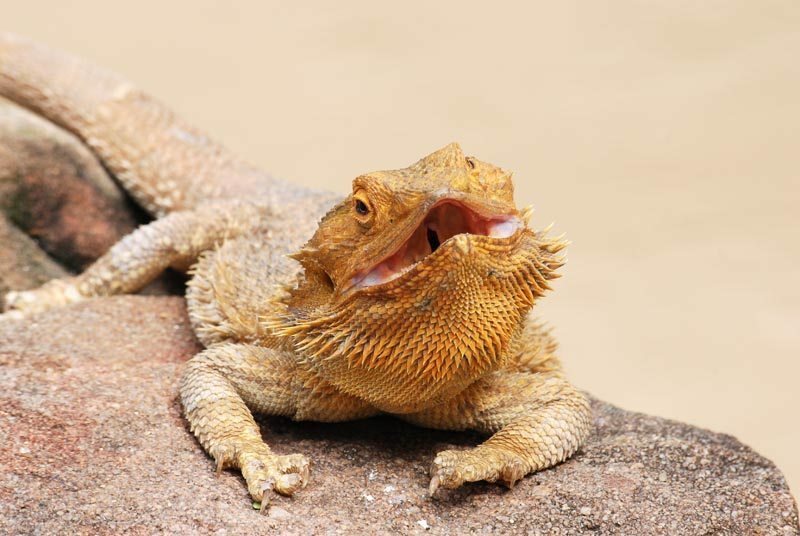 He is keen to branch out into the care of our scaly critters. 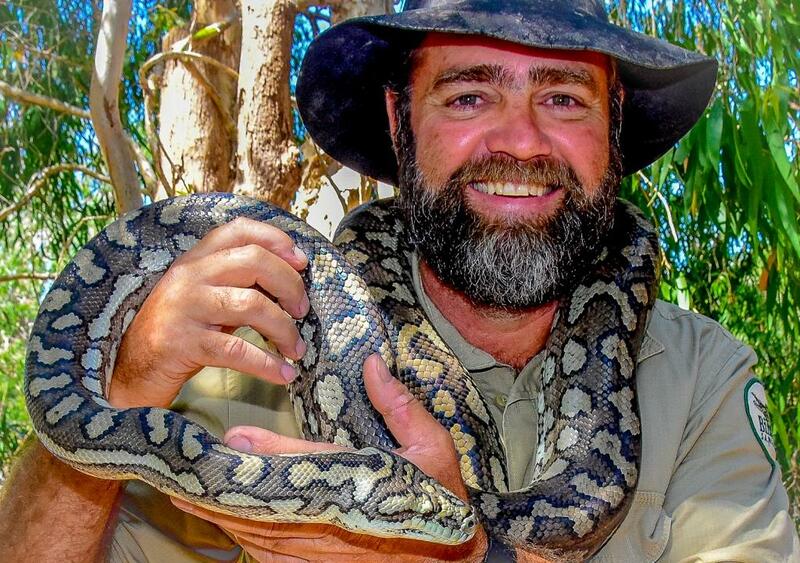 He’staken a venomous snake handling courseand has startedtrainingto work with our crocodiles. Meantime Will is honing his presentation skills, as he starts to deliver more of the daily wildlife talks. Ranger Pio first joined us as a work exchange student sponsored by Skills 360. Despite his shy nature and professed fear of snakes, he was so impressive that we hired him on before he’d even finished Year 12! His fellow team members took him under their collective wing, and he blossomed into a confident, well-informed Ranger. Pio’s gentle nature, his wicked sense of humour and passion for wildlife soon made him a favourite with young and old alike. He even got over his fear of snakes! After 4 years Pio took a break to explore other career options, but returned to us recently with an even greater commitment to our ideals of education through conservation. He’s working hard behind the scenes to assist our Rangers specializing in birds, mammals and reptiles, creating enrichment ideas and developing training routines. In front of a crowd, Pio remains as bubbly and energetic as ever. Everyone leaves his shows with a smile on their face! 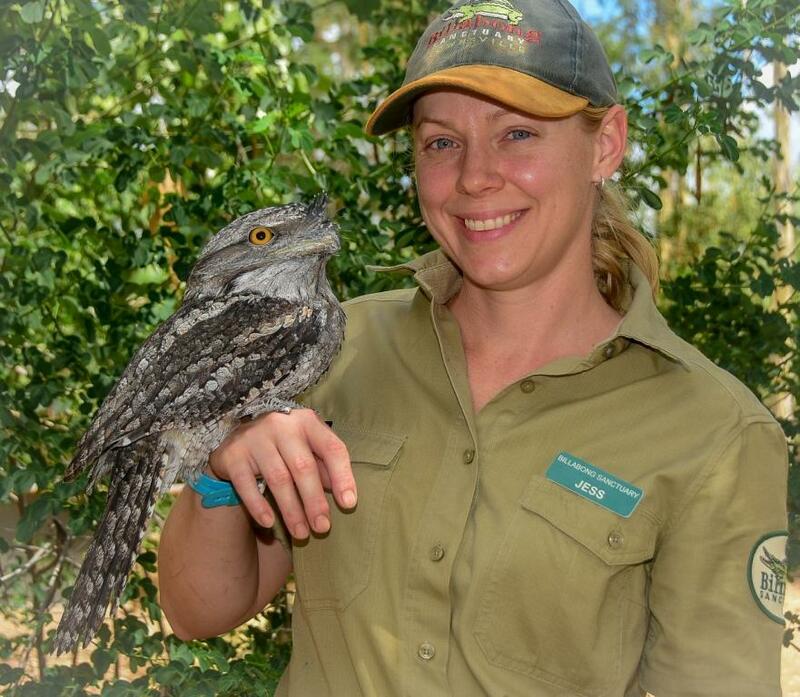 Tabatha was a long-time volunteer at Billabong Sanctuary before she traded in her green t-shirt for a ranger uniform. Originally from Perth, where she volunteered in a wildlife rehabilitation centre, Tabatha is a qualified wildlife carer with a special interest in possums. 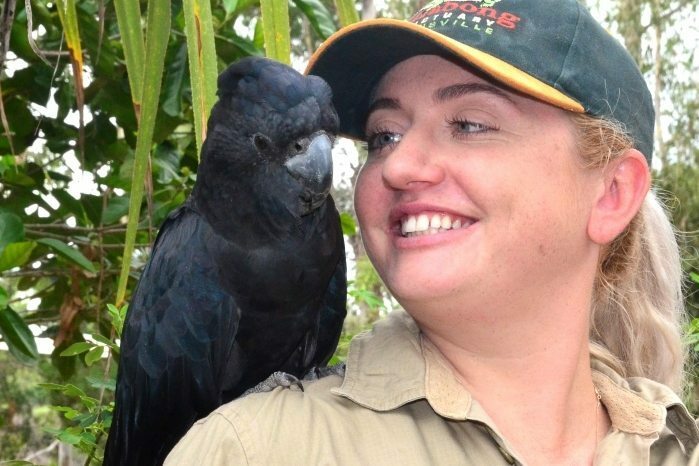 Planning to make zookeeping a full-time career, she’s just completed her TAFE Certificate III in Captive Animals. 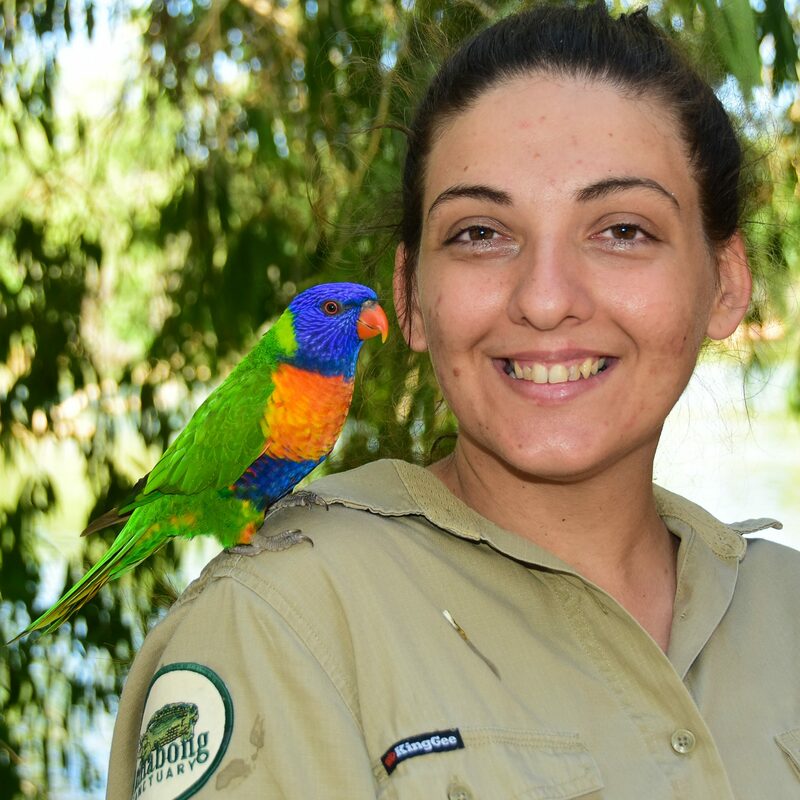 Tabatha has just started presenting the free –flight bird show, and is well into her training with our estuarine crocs—you may see her feeding the big males over the fence, before moving into enclosures to start working with the females. 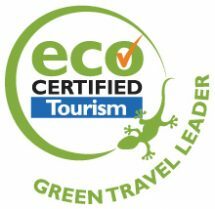 Whether presenting wildlife shows or leading tour groups, Tabs is an engaging speaker, with wide knowledge and an easy rapport with her audience. 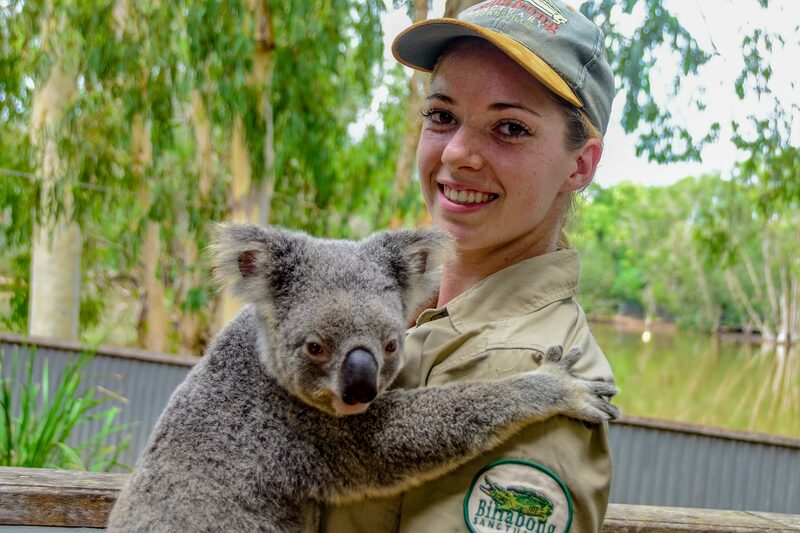 When she first joined us as a volunteer Sara was already very well qualified: She had earned her TAFE Certificate III in Captive Animals while gaining valuable work experience at Currumbin Sanctuary on the Gold Coast. 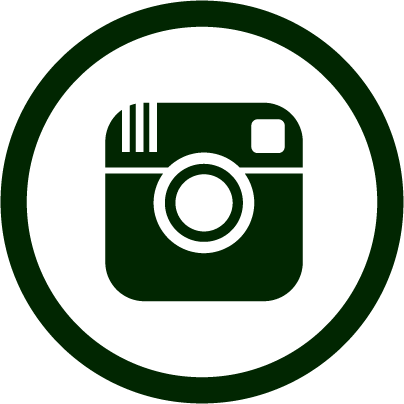 It didn’t take long for her talents to be recognized, and she was appointed first as a casual and soon afterwards as a full-time ranger. 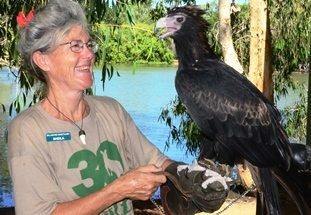 Her work with bird trainers at Currumbin gave her the skills and patience to handle raptors and present our free-flight bird show. Nevertheless, Sara’s first love is reptiles; she’s started training to work with our estuarine crocodiles, and recently completed a Venomous Snake Handling course. Watch for her to be taking an increasingly active role presenting shows featuring these awesome native animals. Sara’s cheery outlook, depth of knowledge and off-beat sense of humour ensure that her wildlife talks are always engaging, educational and fun to watch! 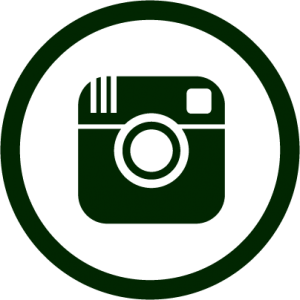 We value highly the contribution of our casual ranger staff. 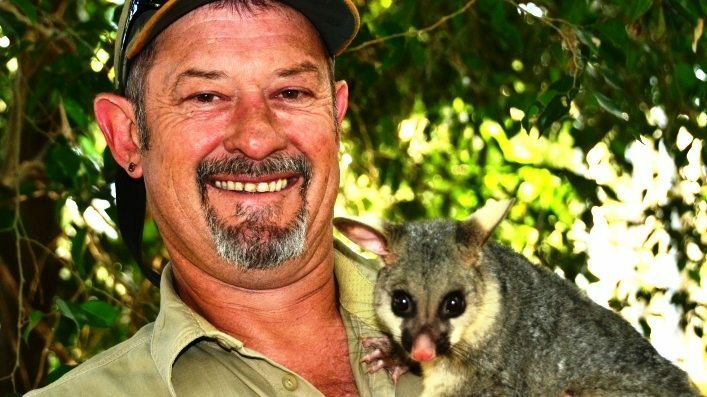 All started out here as volunteers, and it is a tribute to their passion for native animals and their dedication to conservation that they are progressively taking on all the duties of a full-time ranger. 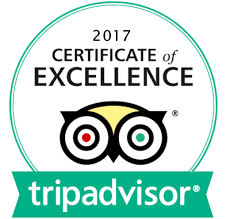 Their assistance during busy times is especially valuable, as they are called in to present shows and lead tour groups. Team leaders Gabby and Mellee and their co-workers Sheree, Summer, Kasey and Tiffany comprise our hard-working front-of-house team. They answer the phones and welcome visitors with a friendly smile and tips on making the most of their day (“Would you like a bag of seeds to feed the kangaroos?”). From Blinky Bill’s Café they serve a tempting array of snacks and meals to satisfy even the heartiest appetite– from Devonshire teas to homemade lasagne. Responding to customer requests, they prepare veggie wraps, gluten-free options and the delectable ‘Billabong Burger’. 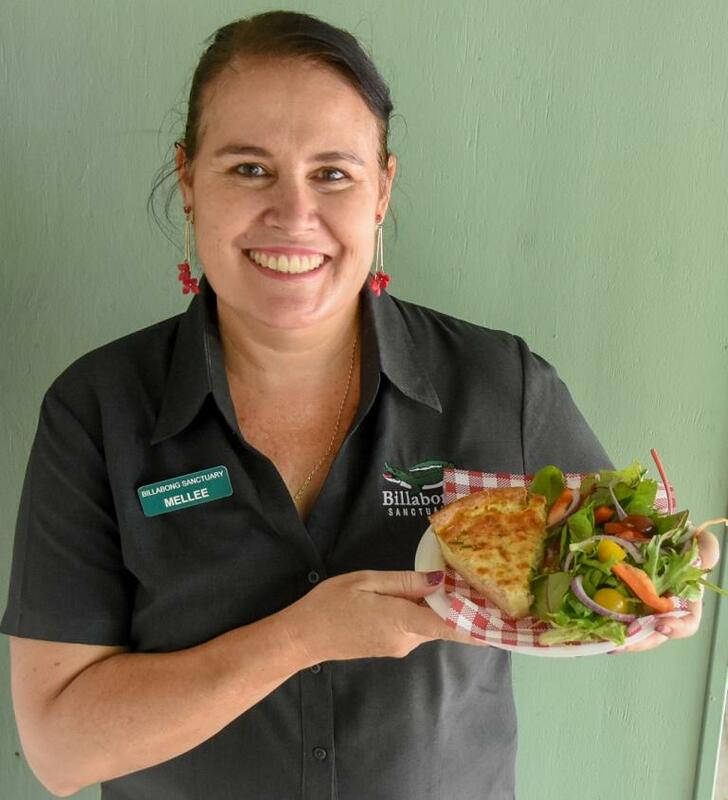 Mellee has recently introduced healthier menu items such as quiches and frittata, with vegetarian and kids’ choices available. The team will also fire up the barbecue to cater for tour groups, parties and school excursions. Mellee keeps the Gift Shop stocked with a variety of wildlife-themed souvenirs and gifts for the folks back home. 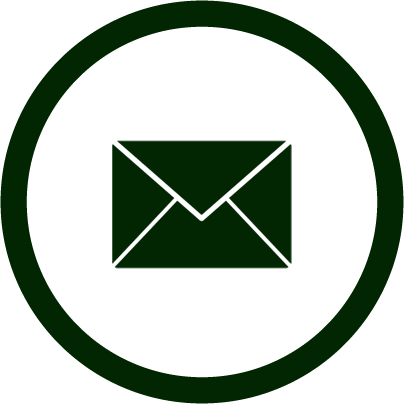 Overall, they complement the work of the Rangers to ensure that everyone who comes through the door enjoys the best possible time in our native wildlife sanctuary. Moggsie takes care of all the infrastructure of Billabong Sanctuary, including the grounds, the enclosures and buildings. 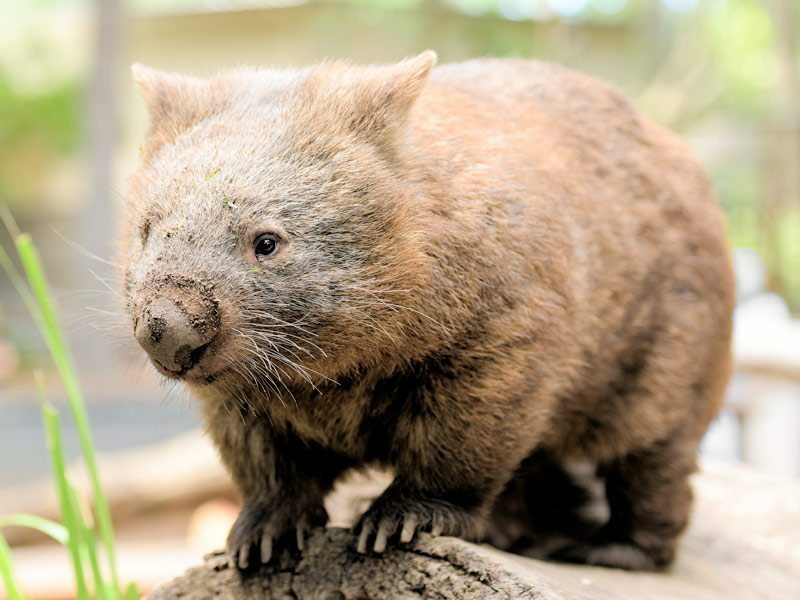 On any one day you could find him laying new irrigation pipes for the croc ponds, fixing a leaky toilet, or installing air conditioners in the wombats’ bedrooms. He loves working with the animals, and is happy to wrangle a feisty lizard so it can be medicated, or shift half a ton of cranky crocodile into a new pond. 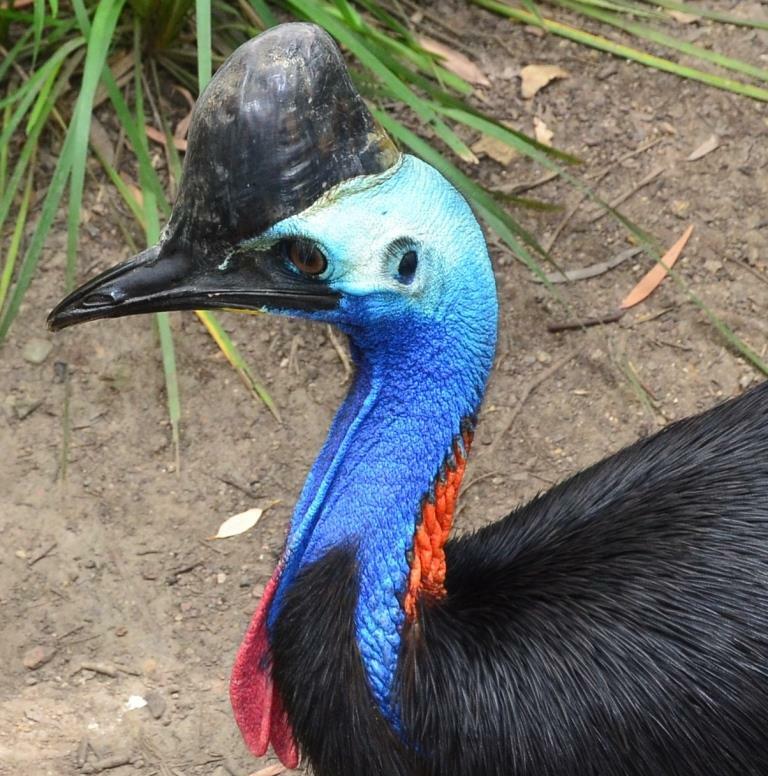 Moggsie realized a long-term goal to gradually rebuild enclosures damaged by Cyclone Yasi , so the back of the park could be re-opened to the public. 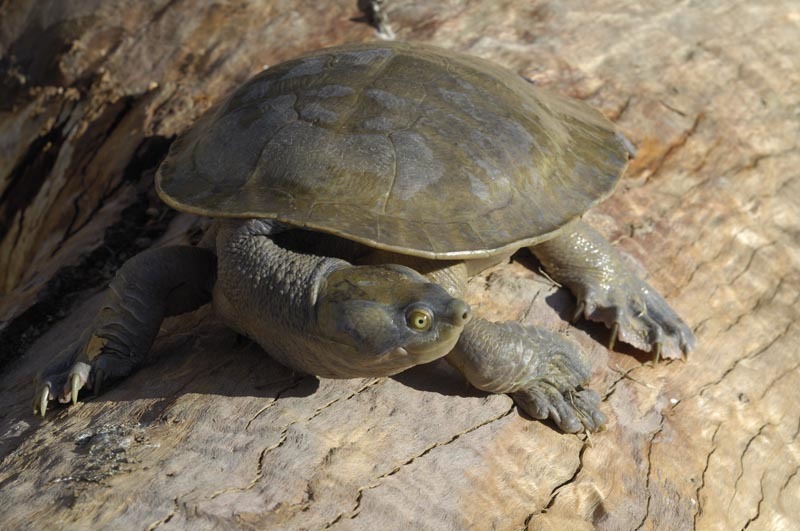 Visitors can now stroll all the way around the billabong, where new displays feature native animals including a scrub python, emus, budgies and the endangered greater bilby. 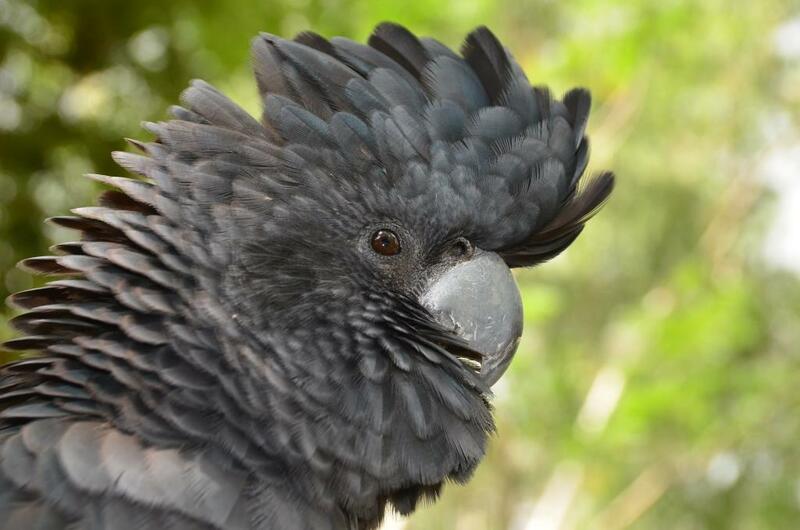 Sheila is a local resident living on acreage with her husband Gregg at nearby Alligator Creek with an abundance of wildlife visitors to her backyard, some being hand-reared and then released by Sheila into the wild, but returning on a regular basis. 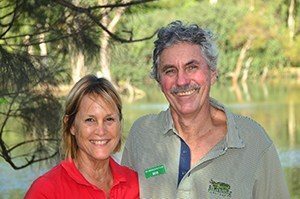 Billabong Sanctuary has been most fortunate to benefit from Sheila’s passion for Australian wildlife as she is our longest serving staff member, although in an honorary capacity. Sheila loves Billabong’s philosophy of introducing local children to Aussie animals and providing international visitors an introduction to Australia’s unique fauna – where to see them in the wild and help in their conservation through our Billabong message. The stories and updates you read on the Billabong website and Facebook on births, acquisitions of fauna, introducing new staff members, coming events such as school holiday programmes are all sourced by Sheila after consulting with Billabong staff. Billabong management utilize Sheila’s love of the Sanctuary as a sounding board, as she is very close to issues which make the Billabong a unique eco based attraction.